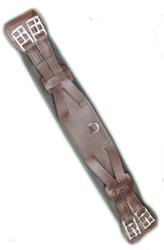 The strada girth is suitable for use with all models. It is designed to distribute pressure evenly around the horse’s chest. 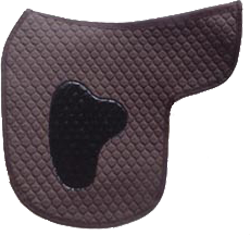 The pad is made from the same high-tech foam that is used in the panels, making the girth comfortable for the horse. It also contributes to the stability of the saddle. The leather used in the girths is the same as that used in the saddles, which gives the ensemble uniform quality and looks. Strada stirrup leathers are made from soft hide, which is wrapped around non-stretch nylon webbing. 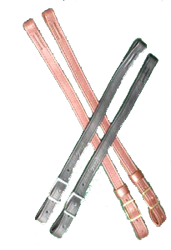 They are single-thickness straps, with a loop at the top and a Conway buckle at the bottom. They are made individually to suit the purchaser’s leg length. The Strada waterbottle holder attaches to the front of the St.Christopher endurance saddle by means of clips on a stout elastic strap. It is a simple but efficient design that prevents the bottle from bouncing against the horse. 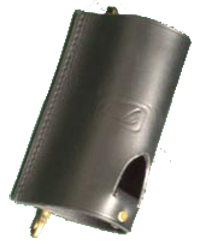 The bottle holder is made from the same leather as the saddles, ensuring consistent quality and appearance. The Strada Endurance Pad is made in the UK by Griffin NuuMed Ltd. to Strada’s own design. It has two layers: Next to the horse is a layer of natural wool, above it a layer of thin polyester felt, which contains a fine mesh. Natural wool is supremely capable of dispersing heat and allowing moisture to vapourise. The felt wicks moisture away from the horse’s body, rather than holding it in. This is very important for endurance horses in particular, as skin that has been softened by moisture will quickly become sore. 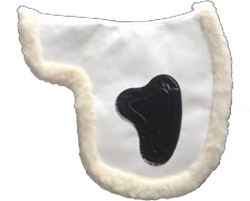 The combination of wool and felt in one pad is extremely efficient at keeping the horse’s back cool and dry. The pad is equipped with a pair of Strada grip patches. The grip patch is made from a special smooth PVC-type material which is highly slip-resistant, particularly when pressed against another smooth surface. Just tightening the girth makes the saddle grip the pad. There is no need for any other form of attachment. The pad is therefore quick and easy to change, a feature valued by endurance riders. It can be washed at 40º C, spun and tumble dried (low heat setting). If the grip patch picks up dust, it can simply be wiped with a damp cloth. Strada numnahs and are made of quilted cotton/polyester by Griffin NuuMed Ltd. to Strada’s own design, which matches Strada saddles. They are equipped with the same grip patch as the Endurance Pad above and available in black, white or brown. 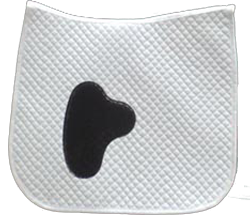 The dressage squares also come from Griffin NuuMed Ltd., again with the Strada grip patches.